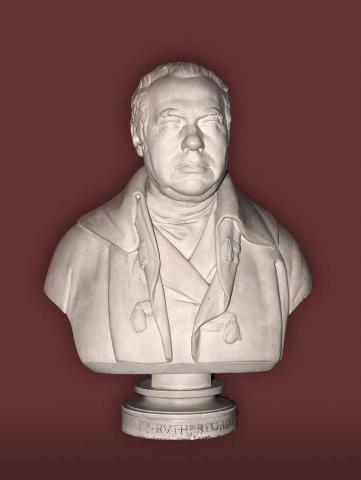 It is not known who created this plaster bust of Rutherford. The artist depicts Rutherford in contemporary dress and he appears to be wearing his academic robe. Having studied under William Cullen and Joseph Black Rutherford graduated from the University of Edinburgh in 1772. After a period of travel on the continent, including visits to French and Italian hospitals, he returned to Edinburgh and established his medical practice. He became a licentiate of the RCPE in 1776 and a fellow in the following year. Rutherford had considerable involvement in the College, acting as secretary for eleven years and censor for six. He also held the office of president from 1796-1798. However, on the death of Henry Cullen in 1791 Ruthrerford was elected to the position of physician-in-ordinary to the Royal Infirmary, where he delivered clinical lectures in tandem with Andrew Duncan and Francis Home. Furthermore, Rutherford was the first Professor of Practice of Physic at the University of Edinburgh and played a significant role in the development of clinical teaching at the university’s medical school.